new children’s books from The Scholastic Possible Fund will be donated to children in need this holiday season through three non-profit organizations that work to improve global literacy: Save the Children,Toys for Tots and Room to Read. The donation was made together with Usher and his New Look Foundation, a nonprofit organization that develops youth from underserved communities into global leaders. 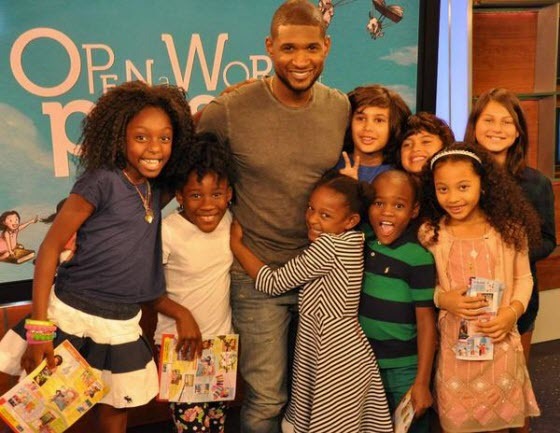 Usher recently joined with Scholastic to launch the new “Open a World of Possible” initiative, designed to elevate the importance and joy of reading for all children. On November 6th 2014, eight-time Grammy Award-winning artist Usher hosted a live classroom webcast, viewed by close to 3 million students and their teachers, where he talked about the ways children can get involved in spreading the joy of reading. For their first call to action, students were asked to learn about three leading non-profit organizations and vote for the organization(s) they’d like to receive a donation of books. Each organization is receiving a portion of the donation from The Scholastic Possible Fund based on the students’ votes.